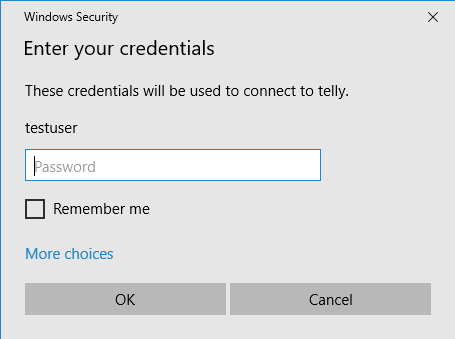 One of the best features of Windows is the Remote Desktop Connection software and one of the most annoying features is Windows' inability (or rather unwillingness) to use the current credential (username and password). Yes, "Remember me" works. But it means having to type the password again and again for every server one visits and saving it for each server individually. The Remote Desktop client stores the username and password in the Windows Credential Manager. It is possible to add a credential to the Credential Manager manually. Adding to the Credential Manager programmatically is similarly simple. Using native code, that is. It is actually a lot more complicated using managed code. The CREDENTIAL struct has to be rebuilt in managed code and the CredWriteW() API declared. The code is much longer and it is very easy to make mistakes.